Combine one cup of long grain brown rice and 2 cups of water with a pinch of sea salt, bring to boil on the stovetop, cook for 15 minutes. After the rice has cooked for 15 minutes, combine cold soy milk, cinnamon, raisins, maple syrup, and chopped almonds in a separate bowl. Add the cold milk mixture to the rice, bring to a boil for one minute. Turn the stove top heat down to low for 12 to 13 more minutes. 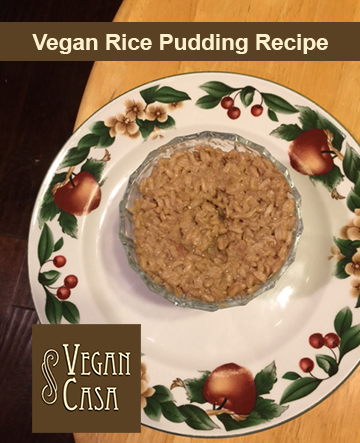 Let cool and place in serving dishes put in the refrigerator overnight and you have a beautiful vegan rice pudding to enjoy the next day.